The second phase of square dance lessons, Mainstream - moves 52 to 68, start in January 2020, and run for ten weeks. Please note: No lessons will be held the weekend of Mid-Winter weekend in Albany. The class instructor will be teaching the remaining Mainstream square dance moves while also working in the moves students learned in the first phase of lessons (B-51) to build on the students' knowledge. Students will be introduced to more singing calls done to a variety of music as the lessons progress. Once the students graduate (complete) lessons, they will have the knowledge to attend regular square dances. 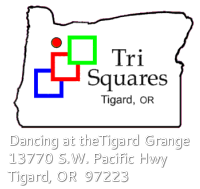 Knowing all 68 Mainstream square dance moves will enable the newly graduated dancer to dance at the Mainstream level at any square dance club locally, nationally, and anywhere in the world. Believe it or not, all Mainstream square dance moves are called in English no matter where on earth you are dancing. Students are encouraged to come dressed casually and wear comfortable shoes. Jeans and tennis shoes are acceptable for all to wear. * Students under the age of 18 must be accompanied by a parent or guardian during all lessons.